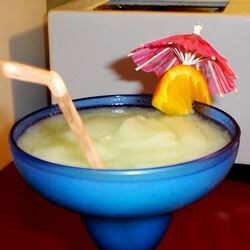 "This is a basic margarita recipe. You can add your favorite fresh fruits to flavor it. Fresh strawberry or mango are good choices. For a little something different, try granulated sugar rims on the glasses instead of margarita salt." Salt the rims of 2 large margarita glasses. To do so, pour salt onto a small plate, moisten the rims of the glasses on a damp towel and press them into the salt. In a blender combine tequila, triple sec and limeade concentrate. Fill blender with ice cubes. Blend until smooth. Pour into glasses, garnish with slice of lime and serve. Basic margarita is right. Probably got this off a bottle of Cuervo. Good for those that have no idea what a margarita should taste like. Excellent margarita's, especially if you like lime. Quick and easy, just like in a restaurant. This was really great. The limeade made it really easy. Absolutely incredible margaritas - especially if you like them on the tart side!! Also tastes great with fresh fruits such as strawberries and peaches! !